Leaving Charlottetown we’ll travel the Trans-Canada Highway East to Point Prim which features the Islands oldest Lighthouse. This 60 foot-tall ( 18.2 meter ) round brick structure is one of the few Lighthouses of its kind in Canada. This tower illuminates the entrance to Hillsborough Bay. Its on to Wood Island’s Lighthouse built in 1876. This fifty-four foot square tower, attached to a six-bedroom house, features one of the only keeper’s quarters still intact. With eleven rooms to tour, you can enjoy historical tales of the Island’s rum-running days, a large sea glass display and stories of the burning/phantom ship. For over 200 years, residents of this end of the Island have seen a burning ship at sea. The last reported sighting in 1978 was so believable that the Northumberland Ferry was sent out to aid the burning ship, only to realize they had been deceived by the phantom. Did you say you like wine? Well how fortunate. We head for Rossignol Estates Winery. 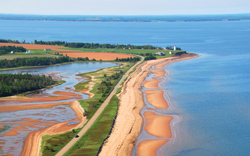 Located on the Shore Road in beautiful Little Sands, PEI. 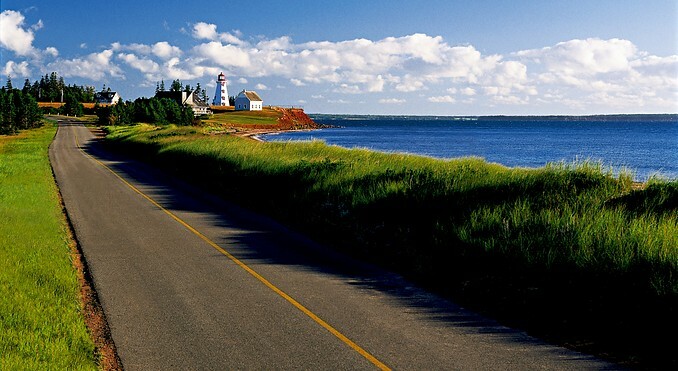 This award winning winery overlooks The Strait from red sand cliffs. While our nonstop, offshore breeze graces the surrounding area, please tour the estate and vineyard and sample their award winning wines. 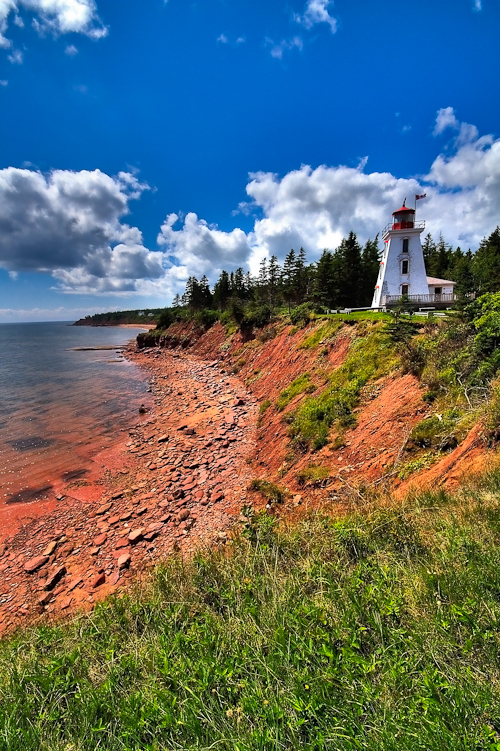 Cape Bear Lighthouse on the edge of P.E.I.’s beautiful red soil. 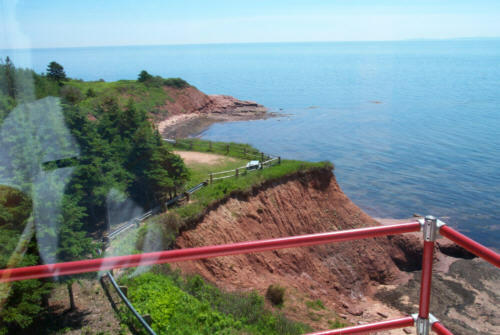 At the Cape Bear Lighthouse, a viewing area allows visitors the rare chance to see a profile of blue water, red cliffs and white lighthouse. 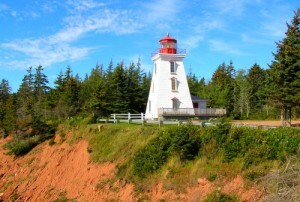 Cape Bear Lighthouse, Prince Edward Island. More Wine? Don’t mind if you do. 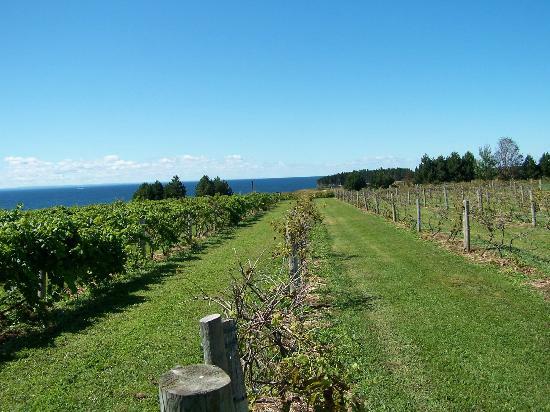 Newman Estate Winery, is a next generation winery located in beautiful Gladstone, PEI. Newman Estate Winery produces of a variety of new age blends featuring Newman Estate White (Chardonnay/Seyval Blanc blend) and New Estate Red (Cabernet Sauvignon/Lucie Kuhlmann blend). 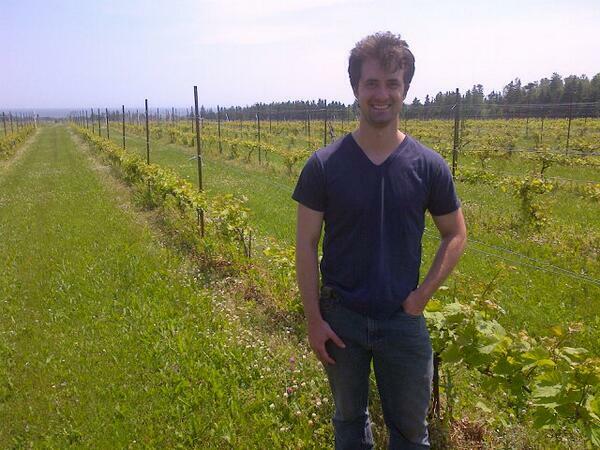 Expanding production each year, Newman Estate Winery is a premier winery from Prince Edward Island. Oh there’s more. The next stop is Panmure Island. 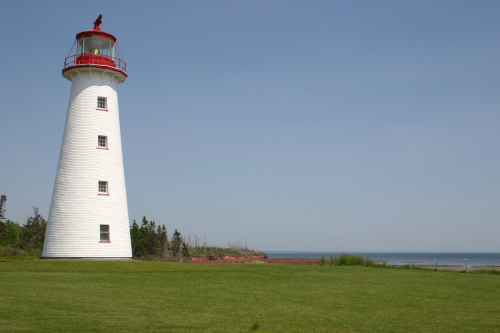 Here you will find the PEI’s first wooden Lighthouse, 1853. It is the sole Lighthouse used to guide crafts into three rivers. The Hindenburg crossed its path in 1937 on its way to New Jersey from Germany. Panmure Island and Panmure Head Lighthouse offer some of the islands most picturesque sea and landscapes. This small island, which has a resident population of 50, welcomes as many as 5,000 visitors to the Abegweit PowWow. The Panmure Light was built in 1853 and a century later, the island was connected to the main part of PEI, by a causeway. This created a sandy dune and a great beach for sunning and snapping photos of the lighthouse glistering on a green plateau at the end of the causeway. The first wooden light built on the Island, it was built like a ship. As a consequence, there are very few nails in this lighthouse. It’s a masterpiece of ship-like joinery held in place by wooden pegs. Even the windows are held in place by wooden slides. In a way, it’s like a large puzzle. You wonder if the right peg were removed if it would come crashing down. Panmure is an important light because it guides vessels on the Montague, Cardigan and Brudenell rivers. The three rivers were designated Canadian Heritage Rivers (N) in 2004. Driving from Panmure to Montague, on Highway 17, is a treat. In the line of trees which line the road there are breaks that seem artist-inspired because they so perfectly frame the landscape that it’s impossible not to take great photographs. Further up, at the Sturgeon wharf photographers will want to snap shots of the thousands of faded buoys piled alone the shore. Montague is the main service community for East Kings. 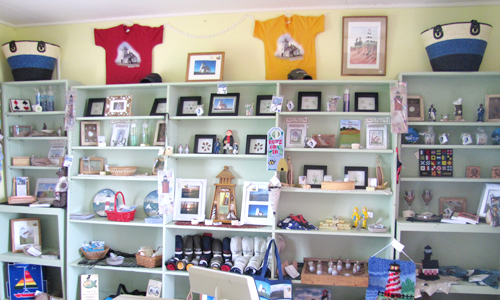 Here you’ll find a variety of accommodations from B&Bs to inns to campgrounds, as well as banks, shops and restaurants. Just beyond the town, in Brudenell which is home to two of Atlantic Canada’s best golf courses: Dundarave and Brudenell. Kings County has fourteen courses, including the Gulf-side Links at Crowbush Cove, easily one of Canada’s top golf courses. In nearby Georgetown, visitors will find more accommodations, summer theatre and a former mayor who makes jewelry out of Island sandstone at Shoreline Design. 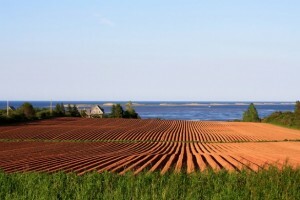 Scenic Farmland view of P.E.I. 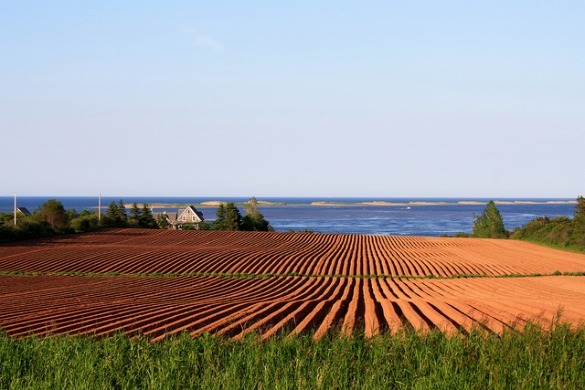 Our drive back to Charlottetown through some idyllic farm land will round out this intensive tour.